Why someone had to invent the word "serendipity." I had planned this evening to finish a report I'm really interested in: the "Fringe City" explanation that I previewed several days ago, and that helps explain why both the economy and the civic culture of our beloved Sioux Falls, S.D., work the way they do. But my wife and I got caught in a downpour here in our current stop, of Burlington, Vermont, and we took refuge in the nearest restaurant we saw, a very nice, moderate-priced, local-local-local place near the lakefront, where we'd been before, called The Skinny Pancake (a creperie). As the rain kept pouring we kept eating and drinking. Future theme: from Michigan to the Plains states to New England, this is the golden age of local beer. How long can this go on? How much excellent beer can even the most appreciative nation absorb? The rain kept us there, and we talked and ate and had more beers. Then suddenly a band started playing at the far end of the room. As soon as the lead male and female singer struck their first notes, every head in the room turned directly at them. They were good, no normal brewpub act. And when I got a look at her I thought, can it be? 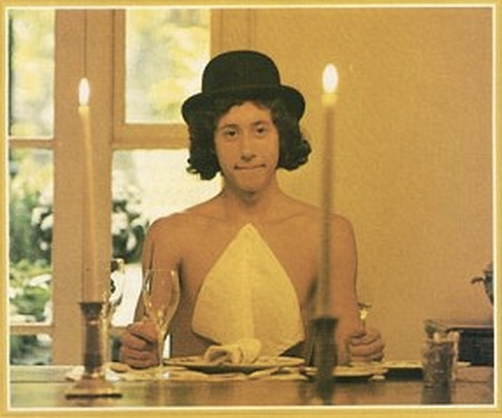 Anyone who had seen Arlo Guthrie, in his Alice's Restaurant phase, would think, I know who this is. And then, "I'm Johnny Irion, this is Sarah Lee Guthrie, we'll introduce the rest of the band as we go on. We hadn't expected to be here tonight ..."
They hadn't expected to be there; a different gig got mixed up. We hadn't expected to be there; it was the rain. The hundred or so people who happened to be having dinner were divided roughly between her contemporaries -- Sarah Lee Guthrie's, and younger -- who no doubt realized they were hearing something special, and our contemporaries, who realized the same thing, but also that that they were hearing Arlo Guthrie's daughter, and Woody's granddaughter. In preparing for our travels, we'd been catching up on Woody Guthrie's chronicles of Americana. This hit us at the right moment. Plans go awry, sometimes in ways that take time to recover from, sometimes in ways that help you understand why someone invented the word "serendipity." More of "fringe city" soon, but for now we are reflecting on what we almost missed.